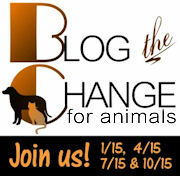 Today is one of four Blog the Change Days each year, meant to inspire pet bloggers to Be the Change for Animals. Regular readers already know about our current Be the Change effort, called Never Shock a Puppy, so I thought I’d share some info and links about another Colorado girl with BIG ideas about taking a new kind of consciousness raising on the road. Please meet Kyla Duffy from Up for Pups: Humane Education Like You’ve Never Seen Before. In this aerial performance, Kyla uses tremendous strength and grace to teach people about the disgrace of puppy mills. The slide show that plays on screens behind her share messages about the reality of puppy mills and the many needs of shelter animals. This video of “Rope Dancer” comes from the BlogPaws West opening night. Kyla is looking for support in many forms, including sponsorships, bookings, and other artists/performers to join the community of creative people to take humane education to new heights. Kyla is also co-editor/publisher of Happy Tails Books: Dog Adoption Stories. You can read all about Kyla’s dog Bill. Other than posting about Kyla here, I’m still trying to figure out how we might work together. I believe so very much in her cause, her methods, and in Kyla herself. She is really a terrific, terrific person. Lilly and I wish her the very best. We went big with our first Be the Change effort, but Kyla has gone even bigger. Kudos to her on that. If you are someone who can help her, or if you know someone who can, I hope you’ll reach out to Kyla. Wow – you guys give me way too much credit, but thank you for all your kind words. I need your support for sure, as the next project is an 1:15 minute long show including aerial fabric and storytelling. Way out of my comfort zone, but someone needs to share these wonderful stories about adopted dogs. It’s on Feb. 12th in Boulder if you can make it. The location is the Dairy Center for the Arts, and the performance is called “Don’t Kill Bill” in honor of my puppy mill survivor. Roxanne, thanks for all the great blogging you do! Guess who voiced their approval at 1:54 in Kyla’s great video! Just couldn’t help myself… wanted to be up there playing too! Thanks for sharing that great performance again! Was that you, Cosmo?! I can only imagine how fun it would be to swing on that fabric, with you tugging at the end. Up for Pups is a great program. I’m looking forward to Kyla’s first local performance! I love this list of blogs. I’m going to go through them this weekend and hopefully read all of them! We love Up for Pups and Kyla was incredible at BlogPaws West! I’m so glad to know about her and her work. She is awesome. All I can think about when I watch her perform, though, is how FREAKING strong she is to be able to do that. She said she’d teach me how to use the fabric like that, if I wanted, but I cannot imagine I’m strong enough to do it. I LOVE Up for Pups. Kyla is a fantastic advocate for rescue animals, and she goes out of her way in such a creative fashion to educate people about the cause. She is warm, smart, and generous with her time. And what a talent! Hi there! Great post, as always! Today was my first blog post for Be the Change…not sure if I did it right, but it still felt good to join in with other anipals and petlovers. Wow… thanks for the info! Great post.